Go back in time with vintage 1920s style gangster stripe suits at ContempoSuits.com. 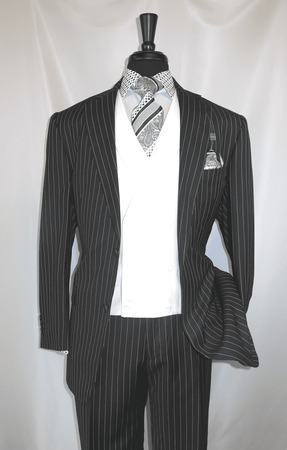 This black gangster style stripe suit just oozes the 1920s with it's contrast style vest and bold demeanor. Featuring a 2 button gangster stripe jacket with side vents and striped pleated pants. Made of fine poly/rayon.